Wednesday morning, Ivan the Terra Bus pulled up at the bus stop in McMurdo right on time. As we were getting on the bus, though, we were informed that we'd be leaving a bit late, in order to let a crew from Fleet Ops (who maintain the roads) check out the conditions and make things safe. Once we finally got the OK and got going, it took us around an hour to get all the way out to LDB, basically twice as long as normal. This put us in a bit of a time crunch, since we had about five minutes to prepare for a training session that we had been planning for our collaborators back in the US. During flight, Super-TIGER will be monitored by teams around the country around the clock, so it was important that everyone understand how this monitoring and commanding of the instrument will work. It took Richard a little bit to set up, but eventually, everyone was tied in and able to see what Richard was doing on his computer screen. He then essentially went through the pre-flight checklist, explaining each command as he went and fielding questions from the audience. Eventually, he got through everything and was able to turn the phone over to Kenichi and Makoto for an explanation of the internal monitoring website. Makoto and Kenichi have developed a system that takes the raw data from the instrument, processes it, and puts it up on a webpage for the monitoring team to see. This includes "housekeeping" data, like what voltages parts of the instrument is reading and what we've set our setting so, and real particle events, which are displayed in a variety of different ways. Talking everyone through the entire website took another hour or so, by which point we were long overdue for lunch. 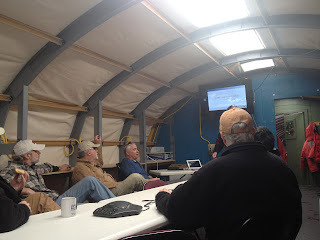 After lunch, I went along to the CSBF weather briefing, where we got an update on the situation for the next few days. Thursday and maybe part of Friday look like they have the potential for a launch window, but after that it's not looking good for a few days. We'll see how things work out in the next few days, and there will be updates on twitter and Facebook as soon as we get word that there will be a launch attempt. Wednesday night in McMurdo there wasn't much going on, so I went to check out the Wednesday soccer games they have. We ended up playing 3-on-4 in a small basketball court in the "Big Gym" in town. It was fun, but exhausting. The slippery floors didn't help very much, either. We'll keep everyone updated if we move towards a launch attempt in the next day or so. Right now, if looks like if there is an attempt on Thursday it won't be until the late afternoon McMurdo time (after 10pm CT Wednesday or so).